UPDATE! The deadline has been extended to Aug 2nd! UPDATE! The prizes have been listed! What has, for decades now, been the history of the Star Wars universe after Return of the Jedi will officially be replaced this December. The story of the Expanded Universe has been told through dozens of books, some of them good and some of the not-so-good. But for many Star Wars fans, those books have been on equal footing with the movies. It has been long enough now since Lucas announced that he would be re-writing Star Wars history, that those of us who are EU fans have come to terms with the fact. But before Star Wars 7 is released, I want to celebrate the former EU with a contest. Because the EU covers too large an amount of time, this contest will only deal with events taking place between 4 ABY to 24 ABY (ABY=After the Battle of Yavin). The contest will also only include content found in books, not video games or e-novellas. Each entry will need to cite which book it is from (exact page numbers not necessary). For those who are less familiar with the EU I would suggest checking out Wikipedia and Wookieepedia's sections on the New Republic era as that is where all the books you can build from are found. Show an interaction between the good guys and the bad guys. Maybe Jacen and Jaina Solo are trying to escape from Qorl, the TIE pilot. Maybe Corran Horn is helping to defeat the ghost of Exar Kun. Maybe Talon Karrde is trying to survive an encounter with Admiral Thrawn. Or maybe the Rogue Squadron is facing off against Ysanne Isard. Whichever characters you choose, this category should be about the interaction between them. 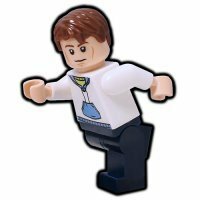 This is not a contest about for making the best custom EU minifigs. This category will be judged based on how recognizable the setting and interaction of the characters is. Build a ship from the EU. This should be a ship that does not appear in the films but only in the EU. Exceptions to this would be ships owned by specific people such as Kyp Durron’s X-Wing or Ysanne Isard’s Super Star Destroyer the Lusankya. Other exceptions would be variations on ships like the Stealth X-Wing. Examples of ships that are only in the EU would be the Wild Karrde, the Sun Crusher, the K-Wing, TIE-uglies, etc. This category is all about the creatures of the EU. Build a brick built Ysalamir of Myrkr, a Crystal Spider from the glitterstim spice mines of Kessel, one of Talon Karrde’s Vornskr, a battle hydra used by Exar Kun, or any other creature from the EU. Alternately, you could use a creature already molded by Lego and create the setting from the EU in which the creature is found. You could build the wampa pack led by the one-armed wampa on Hoth, a Hapan horde of rancors, or other scenes. One entry per member and per category. You can enter all categories with different entries, but you'll be eligible to receive only one prize. There are no size restrictions for any of the categories. The contest will run from 4th May to 2nd Aug, 2015. As long as it's still Aug 1st somewhere in the world, you can still enter. Entries posted after the deadline will be disqualified. This contest is open to all EB members, even if they joined EB after the contest has begun, with the exception of the Star Wars staff, who are not eligible to win prizes. All entries must be new creations, not posted anywhere else prior to being entered in the contest. You may be asked by a staff member to change your entry if it is too similar to an earlier creation. All entries must be built from real LEGO. No clone brands, no third-party custom parts. Digital entries will be allowed. All digital entries must use only existing pieces in existing colors. All entries must be posted as a new topic in the Watto’s Junkyard forum, the title prefixed by, "[sWEU] – category - entry name". (For example, "[sWEU] – Cat. A. - Jacen and Jaina’s Harrowing Escape".) A link must also be included in this thread for your entry to count. Post pictures no larger than 800x640, but you may link to bigger pictures. You may do a 'full-blown photo edit' with all the text, effects, background compositing, support erasing, and other effects on one picture. All your other pictures may have no editing other than color adjustment or background removal for a solid-color background. For obvious reasons, any photo editing that changes the shape, functionality, or color (not tint or adjustment, but actual color) of a LEGO piece is prohibited. It is also prohibited to use the Lego logo in any picture. All entries are considered WIPs (Works In Progress) until the deadline passes. Until the deadline has passed, you are allowed to change and improve your MOC. For each category, EB staff will choose the top 25, and then EB members will vote for their favorite entry among that selection. I have not read any Star Wars books, so I don't know if I'll enter, but an awesome contest nonetheless! Yay! Finally an excuse to create a Dreadnought-class Cruiser! Edit: It literally takes place right after the Battle of Endor. What's the name of the book? Maybe I can make an exception to the list. Wow, how did I miss that book? It was one of the first I read. I've added it to the list now. Ssi-Ruuk away! Can the Dark Empire trilogy also be included? The comic books, set 1 year after the Thrawn trilogy. so no Shadows of the Empire? Hello, I'm back. Sorry I've been quiet for a while (8 months?!) but life has been a bit hectic for me. Things have quietend down a bit now and I've finally got a bit of time to build, and this comp looks like just the thing to get me back into things. I love the eu books and have got loads of inspiration! Can't wait to see what other people come up with. I purposely did not include the comics because I wanted the focus to be on the books of the EU. I know many of the EU books reference want happens during the Dark Empire comics, so you could maybe do a flash-back scene to an event from the comics, but only if it's referred to in the books. So, as example, Jedi Search references the World Devastators (somewhere), as shown in the World Devastator article on Wookieepedia, that is sufficient to portray those ships? Has it been that long two years from the last SW contests? The World Devastators are mentioned in many of the approved books so I say they would be allowed. Yay, can you believe it? Do you mind if I post about the contests in my feeds? Nice one :) But from first time I didn't get anything ;D so we can build only those spaceships/scenes/characters that figure in EU? Yes, only stuff from the EU books listed in the approved list. Great contest with loads of potential. Just wondering if you'd consider adding Dark Empire to your list? It's another series turn novel set some years after the Battle of Endor and deals with the battle against the Imperial Remnant, the return of the Emperor and his clones - it's a well known storyline and spawned two sequels itself! You can check it out here: http://starwars.wikia.com/wiki/Dark_Empire. As befits the Star Wars universe, it's got loads of amazing scenes, settings and vehicles and would be great to include in the contest too. It's another series turn novel set some years after the Battle of Endor and deals with the battle against the Imperial Remnant, the return of the Emperor and his clones - it's a well known storyline and spawned two sequels itself! You can check it out here: http://starwars.wiki...iki/Dark_Empire. I appreciate your interest in the contest and in the Dark Empire comics. The reason they are not being allowed is because they are comics and not books. While they are an integral part of the SWEU canon, there is plenty of source material in the books to draw from without needing to delve into other mediums. I hope that clears that up for you. can we make custom clothes for the figures? As long as the "clothes" match the existing TLG patterns. So you could make your own pauldron or kama, but not a trench-coat. I hope that makes sense. Well, this contest does go for an extra month beyond the battlepack contest so you would have extra time if you wanted to do both.